Even though resident Barbara Anderson passed away this fall, her influence and dedication will continue to help those in need this winter, thanks to a unique project sponsored by The Arbor Company. 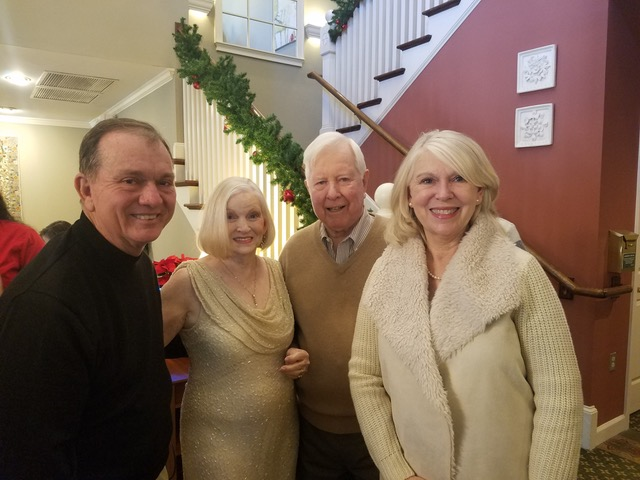 On December 3, Arbor Terrace Athens hosted a fashion show and fundraiser in Barbara's memory, raising almost $900 for Bigger Vision, a winter emergency shelter in Athens, Ga. Barbara, and her husband Richard, who passed away in 2012, founded Bigger Vision in 1999. The event was part of The Arbor Company's "What Could You Do with $1?" campaign, in which all of Arbor's 28 communities around the U.S. were challenged to leverage a small donation – equivalent to $1 for each resident and staff person at each location – to help others in the local community. Arbor Terrace Athens used it's budgeted amount, about $140, to put together the event. "Barbara's family members have been so involved in the community as volunteers, performing as singers for our residents every month," said Rose Cleveland, RN, Arbor Terrace Athens' Executive Director. Even after Barbara passed away at Arbor Terrace on October 12, the family has continued to volunteer. For the fashion show, staff members collected an array of fun fashions from thrift shops as well as on loan from their own closets. Chris Campbell, a cook on the culinary staff who also occasionally moonlights as a fashion model, pitched in to select and group the outfits. The fashions ranged from elegant formal evening gowns to outrageous looks like zebra skin leggings. The hairdresser from Arbor's in-house salon helped prep the models' hair and makeup. Barbara's daughter, Leslie Shaw, as well as representatives of the shelter, attended as honored guests. About 50 visitors attended the show and cheered on residents and staff members as they paraded their fashion looks on a catwalk. One of the biggest cheers went up for resident Catherine Harden, who celebrated her 89th birthday on the day of the fashion show. Escorted by her husband, Catherine modeled a glittering, full-length gold evening gown. As Rose overheard one of Catherine's children say, "Mother could not have had a better birthday present!" There was no entry fee for the event; funds were raised through a silent auction of gift cards, gift baskets and other items donated by local businesses, vendors and referral sources. As a result, the event turned it's $140 in seed money into nearly $900 for Bigger Vision. That money will help homeless people in Athens who might not otherwise have a place to go during the coldest nights of the year. Bigger Vision houses 34 men and women every night from mid-October to mid-April, when year-round shelters typically have an overflow. Guests receive a full array of services: hot homemade meals provided by volunteers, access to showers and laundry machines, encouragement and relaxation through conversations and games with volunteers and other guests, comfortable beds for the night, breakfast in the morning, and help connecting with other organizations in Athens that can help them get back on their feet. Staff members hope to make the fashion show an annual event. "With that initial $140 investment, we were able to support the vital work of Bigger Vision and host a memorable event that brought joy to all involved," said Rose. "And it's even more meaningful knowing that money will help continue a ministry started by one of our beloved residents." Freelance writer Mary Jacobs lives in Plano, Texas, and covers health and fitness, spirituality, and issues relating to older adults. She writes regularly for The Dallas Morning News, The Senior Voice, Religion News Service, and other publications; her work has been honored by the Religion Communicators Council, the Associated Church Press, and the American Association of Orthopaedic Surgeons. Mary’s work is online at www.MaryJacobs.com.